A few weeks ago members from eight different Missing Maps member organizations came together in Dar es Salaam, Tanzania. In addition to hosting our annual meeting, attendees had the privilege of visiting community project and learning sites and attending the FOSS4G (Free and Open Source Software for Geospatial) conference which partnered with the HOT Summit this year. FOSS4G provided us the perfect opportunity to meet-up and engage with our partners and friends from around the world. With attendees ranging from local Tanzanian mapping project teams, to international representation from the World Bank and the UN, to technology giants such as Google and Facebook; FOSS4G had representation from grass roots level all the way to the highest level international organisations, which made it the perfect locations for this years meeting! If geospatial tools and data do not serve humanity; then they are simply toys whose existence are an end in themselves. These were the remarks from January Makamba, the Tanzanian Minister of State for the Environment, at this year’s opening address of FOSS4G 2018. With over 1,000 attendees, FOSS4G is the largest global gathering of open source geospatial developers, users, decision-makers and observers in the world. One of the highlights of the week was attending a tour of a number of Humanitarian OpenStreetMap Team (HOT) supported local mapping projects throughout Dar Es Salaam. 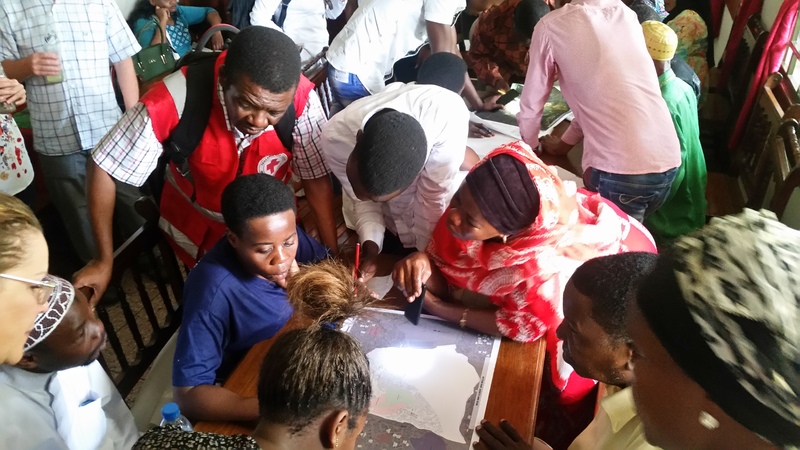 Members of MapAction, the American Red Cross, the International Federation of Red Cross Red Crescent (IFRC), and new HOT staff joined together to visit five different learning environments. HOT is currently supporting multiple projects throughout Tanzania and Africa and works with local universities, communities, technology companies, Red Cross National Societies, and government organisations. Through these projects HOT aims to use OpenStreetMap to create sophisticated and highly-accurate maps of Dar Es Salaam to support the local community. With two of the newest Missing Maps members (MapAction and the IFRC) along for the visit, this was a great opportunity to learn more about HOT programming and understand how many of our individual organizations mapping projects overlap with other organizations work. Another project highlight was a local hospital attempting to become one of the first hospitals in Tanzania to truly understand a patient’s place of origin. The concept behind the project was the brainchild of a local doctor, Dr. Omari Maheza who, frustrated at his inability to reduce the number of malnourished children being referred to the hospital, realised that through tackling the issue at the source it would be possible to reduce the number of referrals to the hospital. However, there was one major problem. No one accurately knew where the patients were coming from. So, just like Dr. John Snow did when faced with a cholera outbreak in London in 1854, Dr. Maheza went out in search of spatial data to inform his work. To tackle this issue, Dr. Omari Maheza approached HOT and, through a collaboration between HOT, the hospital and a local software company, a centralised system was designed and developed to enable the consistent and accurate capture of patient records; including the patient’s place of origin. Residents in Dar do not describe their place of residence through a specific address. 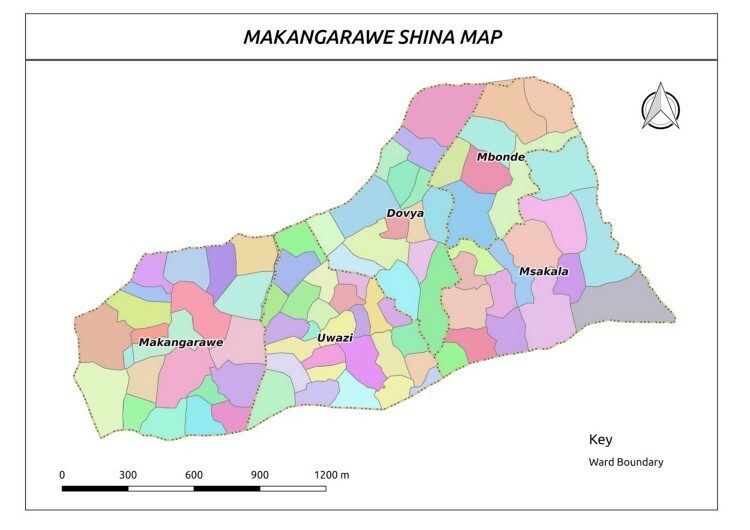 Instead a resident often describes the area they live through a region called a Shina; an area of between 30-200 households administered and named after a community appointed leader. Taking this information into account, it was possible for HOT to develop a system which assigned a patient to a Shina area which in turn linked patients to an area on a Shina boundary map. Over time, as more data is collected, it will be possible to build a clear picture of patient origin, allowing the potential to run advanced spatial epidemiology analysis over the region. Such analysis will help healthcare specialists focus resources in areas of the greatest need of assistance; something that has never been possible before. The project, although currently in its very early stages, could have a huge impact throughout Dar and beyond. The project is innovative and remarkably simple, with strong parallels to how Dr. John Snow used spatial data to understand and explain a health problem in London. Using open source maps, local knowledge and local expertise, it will be possible to identify areas of need at a hyperlocal scale with very little impact on hospital resources. Shina map with ward boundaries. 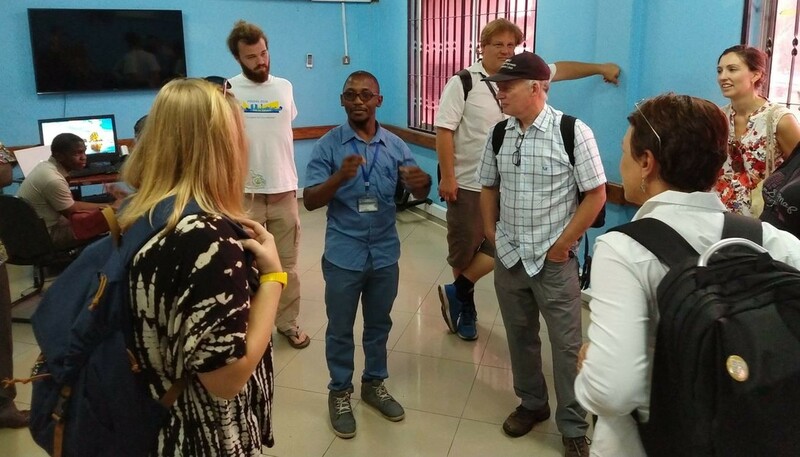 The tour also took us to see the work of the much larger Tanzanian mapping project Ramani Huria (Swahili for “Open Map”), a community-based mapping project in Dar Es Salaam. Every year during the rainy season, Dar suffers from devastating floods that wipe out roads and buildings resulting in many deaths and millions of dollars worth of damages. The damage these floods cause can be prevented with adequate planning, but much of the city is made up of unplanned and informal settlements. By helping communities to map residential areas, roads, streams, floodplains, and other relevant features, the project will bring disaster prevention and response to areas that were previously off the map, literally. The project also builds awareness of the need for flood prevention and risk reduction to the local level, while teaching participants valuable computer and mapping skills that they can put to use elsewhere. Rumani Huria is an excellent example of how the work of the Missing Maps Project has a direct impact on people’s lives. The buildings that the global community has helped to add to the map are now being used to directly contribute to flood preparedness. Missing Maps has helped fund and map with Rumani Huria from the start and it is amazing to see the project grow and expand to supporting these local communities. Full, highly detailed, regional drain infrastructure data has now been mapped and, as the community continues to develop, local projects have sprung up with the aim of adding even further detail to the map. The ingenious use of homemade drones and locally made elevation sensors is helping to develop an accurate terrain and elevation model of the region through the use of locally collected Earth Observation data. Through the collection of this data it will not only be possible to understand those affected by floods but will also enable the development of accurate flood plain maps which can be used to identify the people and areas at most risk to flooding. What does it mean to be mapped? This question was front on our minds as we gathered to discuss Missing Maps Year 5. Missing Maps was originally formed in 2014 by a group of operational humanitarian organizations, and over the past years, we have grown and morphed to become something none of us ever could have imagined. We now include non-operational humanitarian organizations and academics, as well as over 120 student groups mapping in their own communities, so meeting annually is a great way to regroup on priorities and acknowledge and celebrate our achievements. As we look towards 2020, we are excited to continue growing both in terms of organizational membership and by introducing more people to OSM and humanitarian mapping. As a community, we’ve worked hard this year on our internal governance structures and on our shared resources and translations. One thing in particular we look forward to exploring in the next year is the integration of machine learning and artificial intelligence into more our work. As this technology continues to develop, we are excited to see how this new tool can help our mappers. If you are interested in learning more or helping shape this process, please start here. If your organization is interested in getting involved in the program generally, please email info@hotosm.org for more information. We look forward to hearing from you! This post has barely touched upon the high impact work currently being carried out by the open source geospatial community within the rest of the region. From the use of motorcycles in mapping Uganda, to using OpenStreetMap to prevent FGM in rural Tanzania, to discussions on the potential ethical issues behind the use of open data; this year’s conference offered a wide range of topics at both a technical and non-technical level. With a large number of African delegates attending under the assistance of the travel grant programme and a real drive towards ethnic and gender diversity throughout, credit must also go to organisers for bringing together a conference that allowed delegates to show their work to a truly global audience. For many of us, this was the first conference we have attended where every keynote speaker was female and we look forward to watching these young leaders grow. It is an exciting time to be involved in a community which, in the past few years, has begun to have a real sustained impact on people’s lives. The question being asked of the open mapping community is therefore beginning to change. Instead of being asked “Where in the world are communities located?”, it is now being asked “What can we do with this community information?”. Open source geospatial technology has gathered momentum in recent years and it is safe to say open source geospatial tools are no longer merely toys; they are tools which are having a real impact on the world around us. We are entering a new stage of open source mapping and it is something we are excited to tackle together!